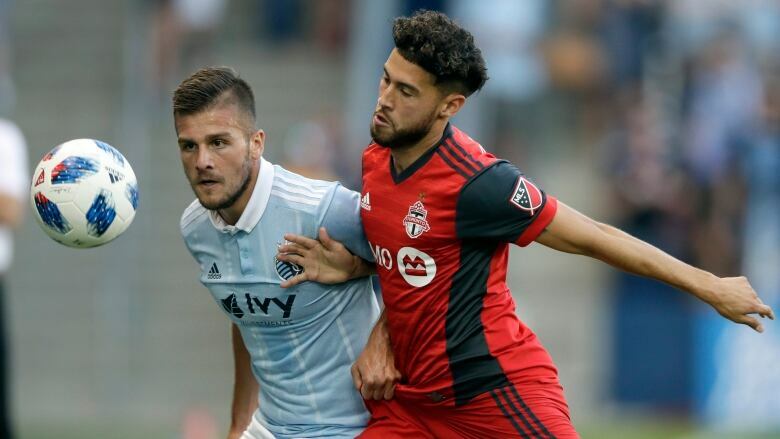 Jordan Hamilton tied it in the 69th minute and Toronto FC held on for a 2-2 draw with Sporting Kansas City on Saturday night. Hamilton made it 2-all with a left-footed shot from 25 yards straightaway that curled inside the left post. The tie snapped a three-game losing streak for Toronto FC (4-10-4). Jordan Hamilton tied it in the 69th minute and Toronto FC held on for a 2-2 draw with Sporting Kansas City on Saturday night. The native of Scarborough, Ont., made it 2-2 with a left-footed shot from 25 yards straightaway that curled inside the left post. The tie snapped a three-game losing streak for Toronto FC (4-10-4). Sporting is a good team in their stadium. We'll take our point and move on," said TFC captain Michael Bradley, whose team was playing its third game in a week. "We'll continue to build on this. Still, Toronto remains winless (0-6-2) in nine tries at Children's Mercy Park. Sporting Kansas City is now unbeaten in its past nine against Toronto. "We would have liked to get three points," Toronto coach Greg Vanney said. "But like I said, in the situation that were in, we've dropped [three consecutive] games, we needed to stop that. We needed to build some momentum. "We worked hard in the things that we've talked about. We did a little bit better tonight. And we've got to start to build some momentum out of that. A Western Conference point, well take it. It's a tough place to come and get anything, so we'll take it. But we know, with the games coming up, we need to continue to get healthy and hopefully we can take three points along the way as well." Jonathan Osorio of Brampton, Ont., opened the scoring in the 25th minute for Toronto, redirecting Justin Morrow's cross into the net. Toronto is winless in its past five games (0-3-2) and has just one victory in its past eight matches (1-4-3). "If we're at any different point in the season, with a couple more points, you're happy coming to Kansas and getting a point," Hamilton said. "Unfortunately, the way the season is going, we would have wanted a win. We'll use it as a building block and get to Orlando (on July 14) and hopefully get a win."